Biography: Irene Gayas Jungwirth primarily painted in oil and in egg tempera applied over multiple layers of gesso. Many of her works are religious and spiritual. Secular subjects range from still lifes, landscapes and fantasies to portraits and children at play. Many images can be found on http://www.flickr.com/photos/westwindsstudio/. Born in McKees Rock, Pennsylvania, Irene Gayas Jungwirth moved as a young girl to Detroit. After taking classes in painting, commercial art and jewelry in Cass Technical High School’s notable art program, she graduated in 1935 with an art education certificate from Marygrove College, Detroit. She taught in public elementary schools and conducted children’s classes in painting, puppet making and puppetry at the Detroit Institute of Arts. After marrying sculptor Leonard D. Jungwirth in 1939, the couple began exhibiting together. They moved to East Lansing the following year when he joined Michigan State University’s art faculty. She died in Ann Arbor, where she is buried. 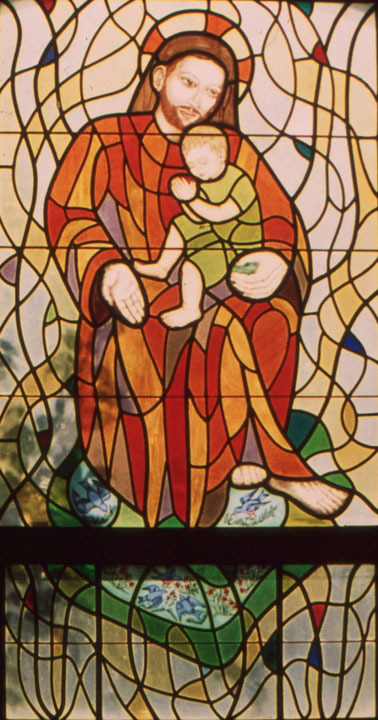 A prolific artist, she also designed stained glass windows for Christ Community Church (formerly the First Baptist Church), Lansing, Michigan. 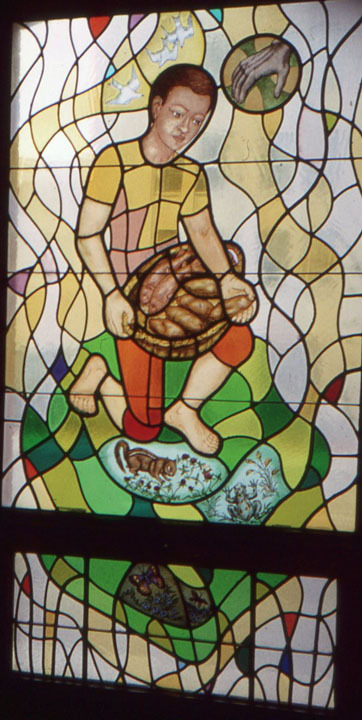 These are registered in the Michigan State University Museum’s Stained Glass Inventory; some preparatory sketches appear on the above website. She designed and made gold, silver and semi-precious stone jewelry, including a crown for the Blessed Virgin statue for Old St. Mary’s Church, Detroit. Art was part of her everyday life; she even personalized Vogue clothing patterns for garments she sewed for herself and her two daughters. 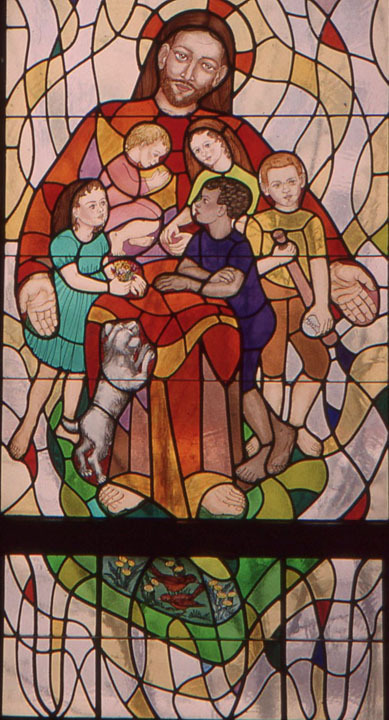 In addition to work in private collections, two of her paintings are in the collection of Michigan State University’s Kresge Art Museum (to become the Eli and Edythe Broad Art Museum in 2012): Virgin with Cherubs and Rose (1948) and Martha Taylor (1965). A photo and description of the 1948 piece appears in the Kresge Art Museum Bulletin, Vol. VIII, 1999, pp. 110-11. Nocturne with Peacocks (c. 1955), at the Detroit Institute of Arts, was awarded the Mr. and Mrs. James C. Whitcomb Purchase Prize, Annual Exhibition for Michigan Artists in 1955. Submitted by Ilene R. Schechter, March 1, 2011.